This is from our fallen limb. I didn’t notice the buds until I started taking photos. The snow hid everything too. Three seasons here: autumn leaves caught by the cold, heavy winter snow and spring buds confused by the change in temperature. This entry was posted in photography and tagged autumn leaves, buds, maple tree branches, snow. Bookmark the permalink. I love how this picture displays three seasons. 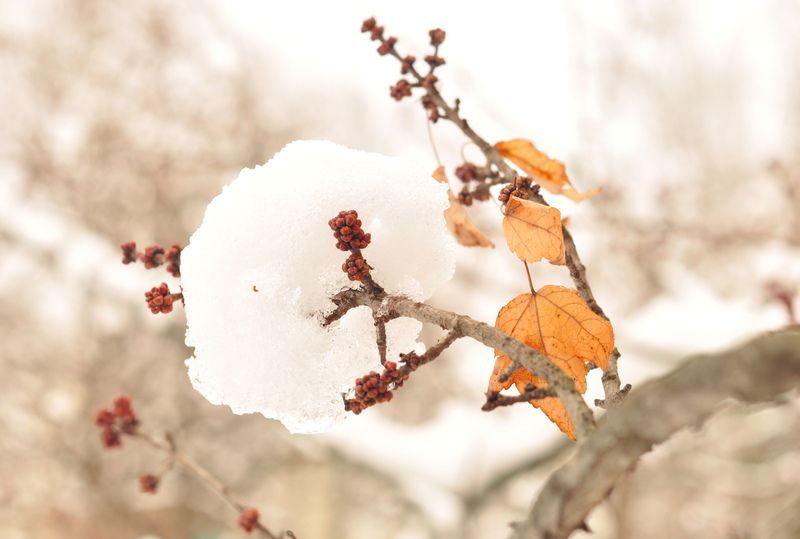 It looks as though there is a donut of snow around the branch. Can’t wait to see the spring buds in Minnesota. We got another inch of snow overnight. Beautiful shot. These delicate little buds have been through a wintery hell! I wonder if there isn’t a way to graft those poor, confused little buds? That’s amazing. I guess one thing that tempts me in photography is the new way to see things. Like when you draw, you really start to look at things in a different way and notice things like this that you might not have seen before. Aw. It’s always sad when the buds come out too early. Incredible shot, though…what an interesting perspective. Oh cool. Too bad those buds are down. What a perfect little photo. The composition is so fabulous and the elements that you captured are in such contrast that it just makes it even more interesting!